The Vegas Golden Knights continue to defy the odds. On Wednesday night, the expansion team in its debut season won its First Round opening game against the Los Angeles Kings in a 1-0 shutout. Vegas finished the NHL regular season with the fifth most points (109), won the Pacific Division, and is the first pro hockey team in its inaugural season to reach the Stanley Cup Playoffs in 38 years. In February, the team emerged as the favorite to win the Stanley Cup. They lengthened slightly over the last full month of regular season play, and enter the playoffs with the sixth shortest line at 10/1. The Westgate SuperBook has the Nashville Predators as the favorite at 4/1. The season-long point leader (117) is followed by the Tampa Bay Lightning (5/1), defending champion Pittsburgh Penguins (6/1), Winnipeg Jets (8/1), and Boston Bruins (9/1). The best-of-seven series price prior to game one between the Golden Knights and Kings had Vegas favored at -135 to LA at +115. Outside on Wednesday afternoon and evening, live concerts, including one from the Blue Man Group, kept fans entertained prior to the 7:00 pm local time game. “Go, Knights, go!” chants could be heard throughout the stadium area. 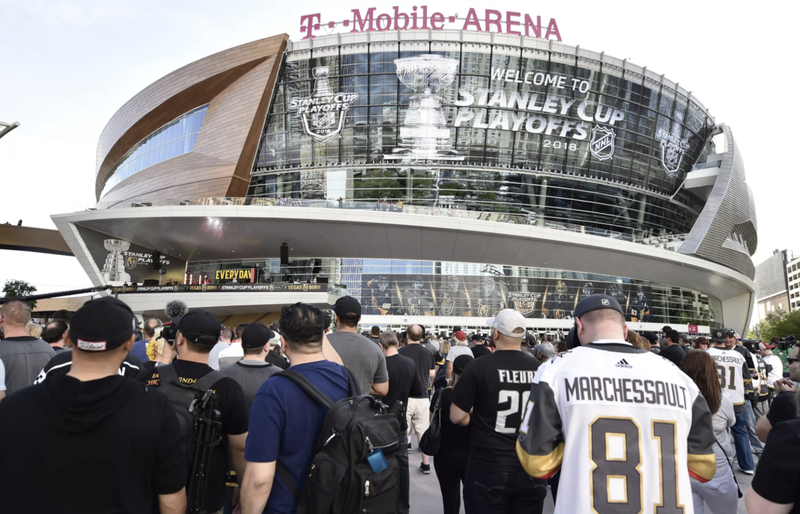 Inside, T-Mobile Arena was more than sold out, with 18,479 in attendance. According to the facility’s own website, seating capacity for hockey is 17,500. 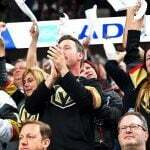 Las Vegas businesses say the Golden Knights have been great for business. “You couldn’t have written a better script for how it’s taken off,” Born and Raised tavern manager Ben Burkhalter declared. 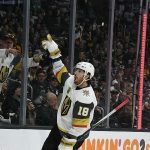 While fans are enthusiastic regarding their chances of seeing the Vegas Golden Knights make a deep playoff run, oddsmakers would welcome that, but certainly wouldn’t mind another team hoisting the Stanley Cup in the end. Few saw this coming. Prior to the first drop of the puck to get the regular season underway, Nevada sportsbooks had the new franchise as long as 500/1 to win the Stanley Cup. As a result, most Las Vegas sportsbooks are carrying substantial liabilities on the Golden Knights if they win the NHL title. Several casinos say they’ve printed more Stanley Cup tickets on Vegas than any other team. There’s an unknown number of tickets out there with Vegas winning the Stanley Cup at 300/1 and even 500/1 odds. A $100 wager would respectively net $30,000 and $50,000 to the fortunate gambler. The implied odds of 500/1 is 0.2 percent. The team’s present line (10/1) represents a 9.09 percent chance of winning. A $100 wager on today’s price still nets the bettor $1,000.